Did you ever work at Modin? To help us make sure only valid Modin Alumni have accounts, please answer at least three of the following questions to the best of your ability. If you don't know the answers, just give us your best answer. 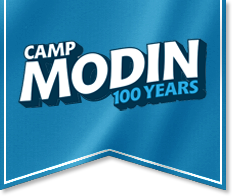 If you are completely stumped, write something in three boxes specific to Camp Modin that will make it clear to us that you, indeed, are a member of the Modin community. (1) What was the name of one of your bunks/cabins? (2) What is/was the name of the campfire site? (3) What was the name of the girls' dining hall? (4) What was the name of the boys' shower house? (5) What was the name of the mountain/hill on the boys' side of camp? (6) What was the name of the campsite or "nest" across the lake? (7) What color was the rock painted that marked the starting point for swim tests on the boys side? (8) What craft was used to transport campers back and forth between boys side and girls side? (9) What is the name of the dining hall? (10) What is the name of the lodge? (11) What is the name of the teen center? (12) What is the name of our long-time nature specialist? (13) What is the name of our long-time waterfront director? (14) Where do we go for ice cream and mini-golf? Your alumni account has been created! You will receive a confirmation email when we have approved your account. At that time you will be able to log in.